New ‘SIX yard Indefatigable’ flag! New ‘SIX yard Indefatigable’ flag was collected today (11/04/12). Seen here IOBA members, Marc Hardman & Russell Jones holding each corner(! ), picture taken at the Albert Dock – Liverpool. 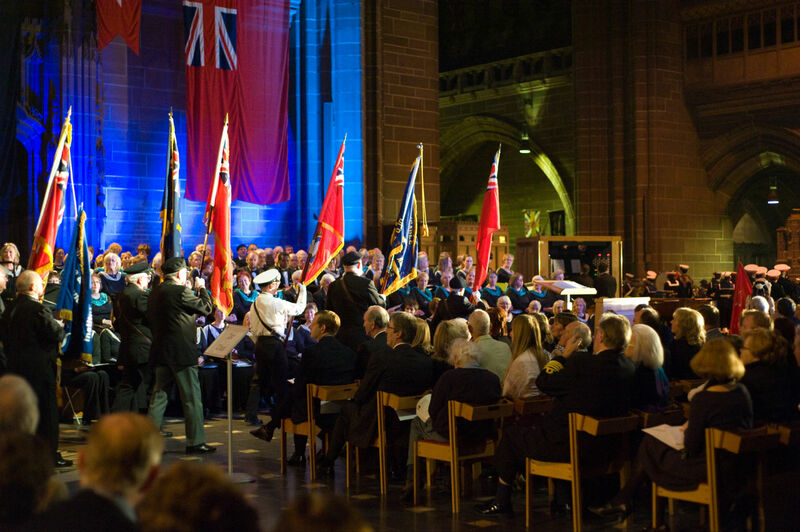 The Blue Ensign was hung at the Liverpool Anglican Cathedral for the ‘Titanic 100th anniversary memorial concert’ Saturday March 24th. 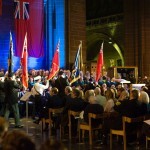 See our Web Page ‘Tribute to Titanic’ for more. 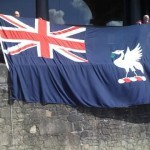 It was agreed to make the flag into our own ‘Ships Flag’, by Ensign Flags Co. A TWO meter ‘Liverbird’ was stitched on both sides (in proportion to the size of the flag). 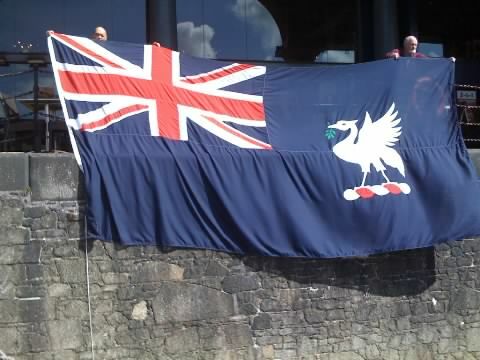 This will have impact when flown at Reunion’s / MN Day above the Liverbird Building itself! Our thanks must go to IOBA Member: Tim Davis 90/94 for giving the blue ensign to the IOBA in the first place, to Pat Moran Hon Member and Marc Hardman 1961 who helped organise the final product. Indefatigable Old Boys Association: Secretary & Archives Secretary.